Erel Shalit: What’s Hyding in the Mirror? What’s Hyding in the Mirror? A birth with gains and losses. The mirror, scratched in the course of one’s life, no longer reflects the images of the outside world, but reflects the silence of wisdom (and, as we are told, Wisdom is the child of Depth and Silence, born out of the Depth of Silence). 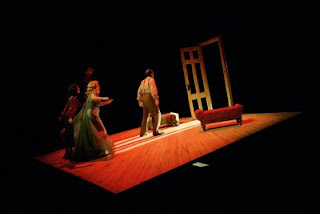 Sartre’s one-act play No Exit (‘Huis Clos’) presents a different image – the absence of the mirror. The hell that Sartre portrays in his play has no exit, and it entails the punishment of eternity (depression, for instance, is hell, because when in depression, the person ‘knows’ there is neither an exit, a way out, nor an end). Furthermore, there are no windows or mirrors in the room. A mirror-less existence is hellish. We know how essential it is for the infant to be mirrored. The libido that streams inwardly, to ourselves, is the healthy narcissistic energy that we need to feel a sense of value, and it requires being mirrored. Not being seen, or carrying another’s distorted projections (which likewise means not being seen), is a self-alienating experience. There are no mirrors in hell. Hell is a non-reflective and unreflected, non-mirroring and non-mirrored existence. Likewise, in fundamentalism there is no mirror. There is only a projection to be destroyed, but no image in the mirror. There are pre-conceived projections, but no reflective imagination. Looking into the mirror, however scratched, requires one to acknowledge the image of one’s own complexity as being simply human, rather than splitting off one’s shortcomings from the image in the mirror. The scratched image in the silent mirror of wisdom reflects the complexity of being human. It means not taking in the images which - considerably more so today than a century ago when Ernest Hyde shared his earnest reflections from the grave - bombard us from the outside. And it means not to be deluded by the false appearance of the image of ourselves, in the smooth and flawless mirror, from which self-reflection is absent.